As published in the Geelong Advertiser LAST Sunday six-year-old Fergus McIver became the fourth horse to die in a jumps race this season in Victoria. ANOTHER ONE BITES THE DUST: Fergus McIver goes down in the J. J. Houlahan Hurdle. This brings the total number of jumps deaths this year— in Victoria and South Australia combined — to 10. This includes three deaths that occurred during trials. Clearly, this sport subjects animals to a totally unacceptable risk. In the last few years, some of the injuries which have either caused death directly or resulted in the horse being euthanised include: broken neck, broken elbow, broken shoulder, fractured foreleg, fractured spine, fractured pelvis, internal injuries and compound fractures to forelegs. 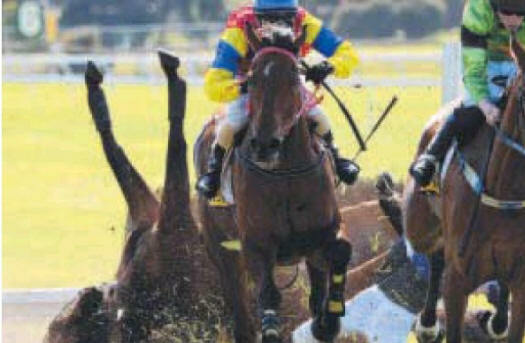 Because of the unacceptably high risk of death and injury to horses, jumps racing has been banned in New South Wales. Shamefully, however, the Victorian and South Australian governments continue to view these deaths and injuries as acceptable in the name of entertainment. Back in 1991 a Senate committee recommended that jumps racing be phased out over three years. The racing industry disregarded this, however, and since that time more than 200 horses have been killed in Victoria alone. Apart from the horses killed, many others suffer from painful injuries and those who fail to win races are often heartlessly disposed of in an abattoir or knackery. Whilst claims are made that jumps racing saves horses from the knackery, the reality is that this is where most racehorses will likely end up anyway. Consequently, jumps racing does not save horses’ lives, it simply prolongs their suffering. Another claim made by those in the industry is that jumps horses are loved and well cared for but if the animals were genuinely loved, they’d never be sent to a knackery. Nor would they be placed in a situation where they have a high chance of being killed or injured on the racetrack. Another false claim often made is that horses love to jump. Though it is possible that some horses may like to jump occasionally, horses will nearly always avoid doing so if given the choice. This is because they will instinctively avoid danger. The reason why horses jump and race is because they are forced to do so through dubious training methods. Where did jumps racing originate? This ‘sport’ began in England as cross-country contests in which participants would ride from one village church steeple to another over several miles — hence the term ‘‘steeplechase’’. The first jumps race to be held on a specially made racetrack was conducted at Bedlam, England, in 1810. Because of its high rate of death, and the shocking nature of the falls and injuries suffered by horses, this style of racing has been controversial since its beginning. For more than 100 years, rock walls and water obstacles were regular features of jumps races, but increasing public pressure during the latter half of the 20th century caused racing authorities to work at improving its image and reducing its fatality rate. Rock walls and timber obstacles have since been replaced with live hedges and nylon brush jumps but, in spite of these initiatives, the death rate in jumps racing consistently remains at around 20 times that of normal racing. Clearly jumps racing is a cruel and dangerous ‘sport’ that needs to be banned everywhere.